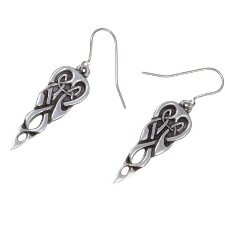 Hand finished Pewter Crosses with engraved Celtic knotwork and cabochon on surgical steel curb chain. 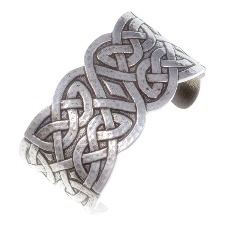 Hand finished Pewter openwork St. Pirans Celtic Cross with embossed design on surgical steel trace chain. 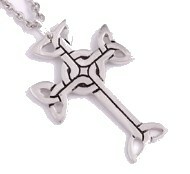 Hand finished Large, Pewter openwork Cross with embossed Celtic design on surgical steel trace chain. Hand finished Pewter St Petroc's Crosses / Necklets on surgical steel curb chain. St Petroc was a Welsh nobleman who was educated in an Irish monastery and then sailed with a small band of followers to the Camel estuary. He built a church at Padstow with a Celtic monastery as a centre for spreading the Christian faith. In his travels he also started churches in Bodmin and Little Petherick, as well as in many parts of Britain, Wales and Brittany. King Constantine ruled the area at this time and was said to have been converted to Christianity by St Petroc when he rescued the deer that the King was hunting. 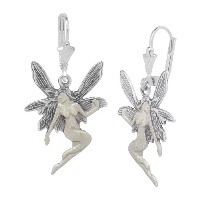 There are many legends about St Petroc's healing, miracles and banishing monsters. He was buried at Padstow. In the 12th Century St Petroc's Church in Bodmin obtained his relics and put them in a painted ivory casket, which can still be seen today. 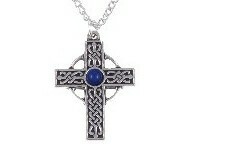 Hand finished Large, pewter openwork Celtic Cross with embossed design on surgical steel trace chain. 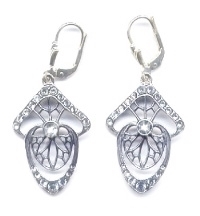 Hand finished Pewter Celtic Crosses with embossed knot design and central cabochon on surgical steel curb chain. 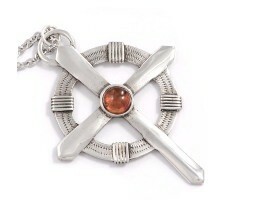 This cross is available in a choice of 5 different gemstones. 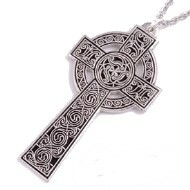 Large hand finished Pewter Cashel Cross with embossed design on surgical steel trace chain. 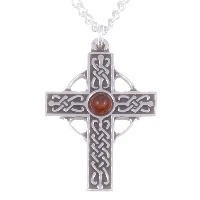 Large hand finished Pewter Celtic Cross with embossed knotwork design on surgical steel trace chain. 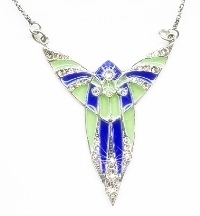 Large hand finished Pewter Kaleidoscope Celtic Crosses on surgical steel trace chain. 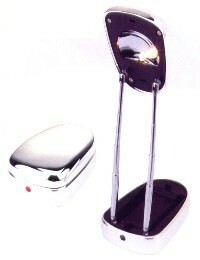 Large hand finished Pewter Robin of Locksley Crosses. 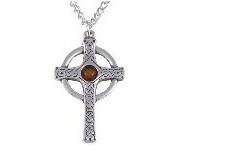 (Robin Hood Cross) on surgical steel trace chain, with an Amber setting. On returning from the Crusades, Robin of Locksley waged a campaign on the Sherriff of Nottingham to win the hand of Maid Marian. 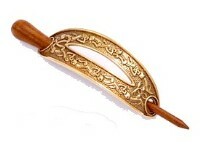 Known as the outlaw Robin Hood, legend claims he lived in Sherwood Forest and stole from the rich to give to the poor. Hand finished Pewter 'Avalon' Cross on surgical steel curb chain. A reproduction of the lead Cross alleged to have been found on the grave of King Arthur by Monks at Glastonbury Abbey in 1191 AD. "Here lies buried the renowned King Athur in the Isle of Avalon"
Large Hand finished Pewter openwork Crosses with embossed Celtic design and central cabochon on surgical steel trace chain. 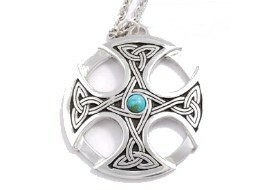 This particular one is specific to Wales and contains the Holy Trinity triscele knot within each cross section of the design. 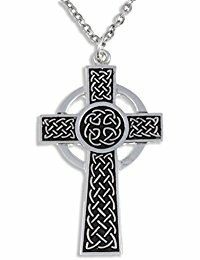 Large hand finished polished Pewter Clonmacnois Celtic Cross with embossed knotwork design on surgical steel trace chain. 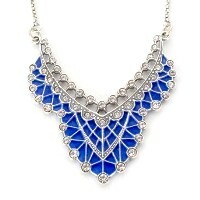 Hand finished Plaited Cross Necklet. 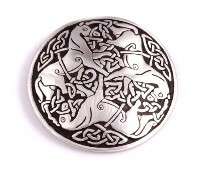 A pewter Celtic cross with embossed Celtic knotwork and cabochon on a tin-plated curb chain. 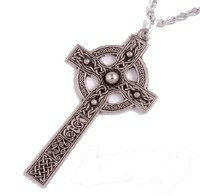 Hand finished plain Pewter Ancient Celtic Cross on surgical steel trace chain. 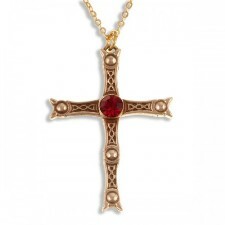 Hand finished Bronze Crosses with embossed design and set with a ruby red crystal on gold-plated brass chain. 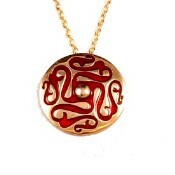 Design inspired by a large gold and garnet cross found amongst the Staffordshire Hoard.